One of my favorite parts about cooking is the mystery. The fact that, to at least some degree, I have no idea how or why flavors mesh together the way they do makes it exhilarating to try new things and have them blend into a beautiful and interesting taste. My flavor-melding testing favorite is with a soup. A soup can be as complicated as any dish or as simple, but can be very forgiving -- if you at least know how to massage the texture and flavor, evening things out until they're perfect. I've heard many times on shows like Top Chef and others that if you can create a great soup, you can be a great cook. I would love to say that I have created a perfect soup recipe that I have tested 100 times, but I do not. For now, that's probably not even my style. I'm content flexing my creativity, working out the details as I go, and then, if it really seems like a winner, perhaps trying to formalize it a little bit more. Recently I had the urge to make a meal out of soup. I wanted it to be hearty but not heavy and contain all the elements of a good meal for me (protein, fiber, vegetables, healthy fat and taste). For some reason I immediately thought of a black bean soup. It seemed to fit the bill. It wasn't going to be easy, but I was prepared to get into war mode (or test kitchen mode) and make it work no matter what happened. I started by heating up a base for my soup in a smaller pot. I wanted it to be a little rich, but not overly fattening, so I used equal parts low-sodium vegetable stock, skim milk and water. It was probably a cup to 1.5 cups of each. I added a little pepper, Tabasco and about 4 ounces of Tequila to the stock as well. I wanted to give it some character and zing, and those were my secret ingredients for adding those elements to the base of the soup. While this was heating up, I sautéed some smashed and chopped garlic, half of a chopped onion and half of a chopped jalapeño in a little extra virgin olive oil at the bottom of my large soup pot until they were soft and emitting aromas and juices (5 minutes). 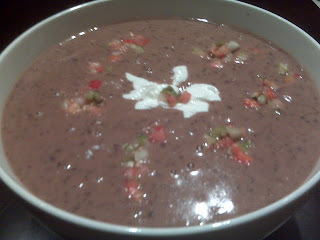 I then added two cans of low-sodium black beans un-drained to the soup pot to mix them with the flavors at the bottom and heat them up a little. Then I added one 15-ounce can of low-sodium crushed tomatoes to the mixture as well. I did this to add some tang, some more Mexican flavor as well as a little more body. I also wanted to add another really nutritious element to the soup, and cooked tomatoes are about as nutritious an ingredient as there is. Plus it went great with the context – kind of important for the whole taste part. After just a couple minutes of warming the beans and tomatoes with the aromatics, and when the base was warmed up but not boiling, I carefully added the base to the ingredients and brought the heat to just above medium. I then stirred the pot very well for a minute or so, so that all the flavors, textures and colors of the ingredients could mix within the base. At this point, I noticed that the soup seemed thin. I knew it was going to thicken more when I pureed it and didn’t want it to be like chili, but also wanted it to have a slightly thicker constitution. So I added just a couple of tablespoons of cornstarch to the soup. I stirred it in very well, as cornstarch lumps up very easily. The only reason I didn’t try to mix the cornstarch with something else (like butter) to eliminate the lumpiness was because I was going to be pureeing the soup shortly, which would solve my problem without resorting to an unnecessary ingredient like butter. Before pureeing, I added the zest and juice of a lime for more flavor, along with a small pinch of salt, small splash of red wine vinegar and generous amounts of pepper, cumin and some fiery, green Habañero sauce to taste. I kept adding little bits of the spices and tasting it until the taste was great. And then let go on the heat for another 10 minutes or so. Tip: cumin is killer in anything Mexican. Use generously and do not omit – or you will likely not get the flavor you desire. Now for the fun (and messy) part! I wanted a smooth texture but not applesauce, so I wanted to use the food processor to puree the soup. This would give it that texture but not kill all the chunks, and also do the real thickening for me. I carefully (remember – HOT!) ladled soup into the processor, about halfway up the machine and whazzed it (my homage to Jaime Oliver). I transferred it to my serving bowl and continued whazzing the soup in half-full batches until I had finished with the entire pot. At this point, the consistency of the soup was great – just a little thick, but not chili. I tested the flavor again and adjusted the spices (pepper, hot sauce, cumin, salt) to perfect the flavor. Then I added in one small can of sliced green olives (rinsed) and mixed it through one more time. I ladled the soup into bowls and gave each one a little grate of gruyere cheese, a little spattering of fresh salsa and a little dollop of reduced-fat sour cream and served with some low-fat Toasted corn chips I had made quickly in the oven (see post 7/30/08: Tangy Toastadas… ). My test kitchen soup was better than I thought it would be, and got excellent reviews from the rest of the tasting committee (of one, for now). I think it is important to play with big flavors like I was trying to do here to see what works and what doesn’t and what is just awesome! It helps to expand our food culture and knowledge. And knowing how to adjust the texture and smaller flavors along the way will allow you to “test” things yourself and still come out with a pretty darn good final edible.